"A column by Glenn Garvin on Dec. 20 stated that the National Science Foundation 'funded a study on Jell-O wrestling at the South Pole.' That is incorrect. The event took place during off-duty hours without NSF permission and did not involve taxpayer funds." Corrections such as this one from the Miami Herald have become a familiar sight for readers, especially as news cycles demand faster and faster publication. While some factual errors can be humorous, they nonetheless erode the credibility of the writer and the organization. And the pressure for accuracy and accountability is increasing at the same time as in-house resources for fact-checking are dwindling. Anyone who needs or wants to learn how to verify names, numbers, quotations, and facts is largely on their own. 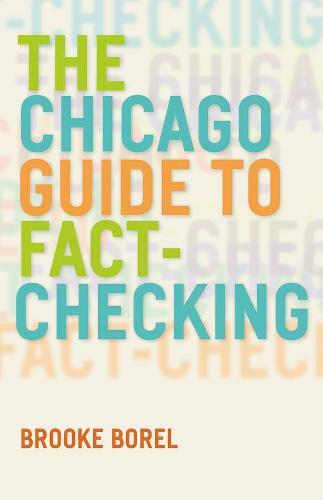 Enter The Chicago Guide to Fact-Checking, an accessible, one-stop guide to the why, what, and how of contemporary fact-checking. Brooke Borel, an experienced fact-checker, draws on the expertise of more than 200 writers, editors, and fellow checkers representing the New Yorker, Popular Science, This American Life, Vogue, and many other outlets. She covers best practices for fact-checking in a variety of media from magazine articles, both print and online, to books and documentaries and from the perspective of both in-house and freelance checkers. She also offers advice on navigating relationships with writers, editors, and sources; considers the realities of fact-checking on a budget and checking one's own work; and reflects on the place of fact-checking in today's media landscape. "If journalism is a cornerstone of democracy, then fact-checking is its building inspector," Borel writes. The Chicago Guide to Fact-Checking is the practical and thoroughly vetted guide that writers, editors, and publishers need to maintain their credibility and solidify their readers' trust. "An indispensable resource in the age of 'fake news, ' this slim but informative title offers writers, researchers, and journalists best practices for fact-checking in a wide variety of media." --Best Reference Titles of 2016 "Library Journal "